The Concorde first flew over 25 years ago, and yet it remains the pinnacle of civil aviation development for one reason - speed. The Concorde is the only aircraft in the world operating scheduled passenger flights at supersonic speed. An engineering masterpiece, the Concorde was the result of a collaborative venture between the aviation industries of Britain and France. 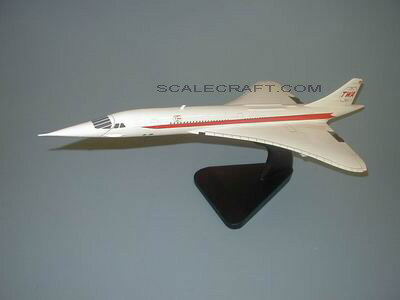 It dates back to design work for a supersonic airliner carried out by Sud Aviation and Bristol, their respective Super Caravelle and Bristol 233 designs being remarkably similar in configuration to each other. The forecast high costs of any SST program and the similarities in the designs led to a 1962 government agreement between France and Britain which resulted in the British Aircraft Corporation (into which Bristol had been merged) and SudAviation (which became a part of Aerospatiale in 1970) joining to design and develop such an aircraft. TWA initially ordered 10 Concordes for international service but the order was eventually cancelled. Mahogany Wood. Scale: 1/100. Wingspan 10 1/4 inches, Length 24 1/2 inches.